Now is the time- Be part of a legacy! Help us realize the goals of Return to Freedom’s Capital Campaign for long term sustainability! 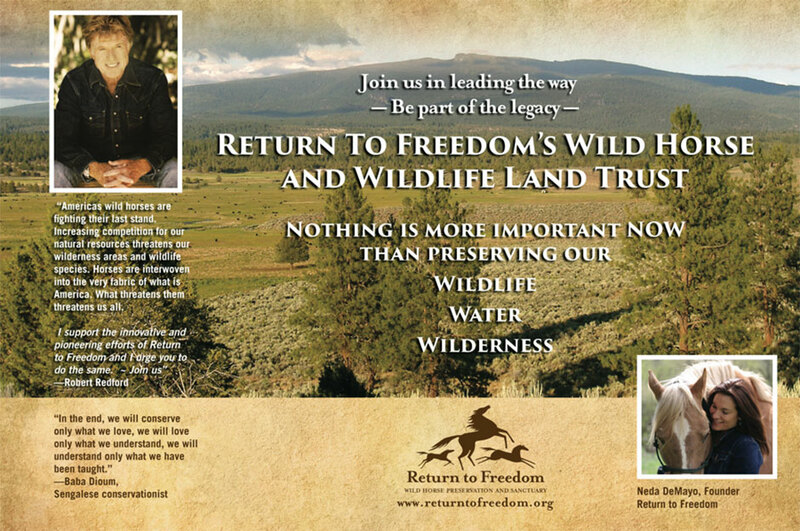 Return to Freedom is poised to take our management model to the next level by creating a first of its kind Wild Horse and Burro Conservancy and Wilderness Preserve. This historical Land Trust will ensure the conservation of disappearing pure in strain Spanish mustangs, expand our management model as it can be applied on wild horse ranges, and be home to natural family bands captured from federal lands. Wild horses are a valuable part of the ecosystem. By protecting these free-ranging, sentient animals we also protect and preserve the open spaces in which they flourish. Suitable land for this project is expensive and it will only become more expensive. Be a sustainable refuge to wild burros and diverse herds of the American Mustang to live undisturbed in their bonded family and social bands for generations to come. In February 2015 we celebrated our 17th Anniversary as a leading organization for the preservation of wild horses and burros. Please consider a legacy donation to support our Capital Campaign to ensure our long term sustainability for America’s wild horses and burros! Help us protect bonded herds for generations to come. The Wild Horse Land Trust has been developed to assure that funds and donations are earmarked exclusively for this expansion effort. Donors will have their name added to our “Sponsor an Acre” plaque that will be mounted as a permanent ‘Wall of Honor” at the land trust. This donation makes a meaningful gift for birthdays, anniversaries, in memorium, or for any horse lover-on any occasion. Video is the most powerful documentation we have to expose the plight of America’s wild horses. We have chosen a sampling of videos that best depict the roundup, capture, and dissemination of wild horses throughout our country. Please view them at your own risk; some are graphic — but do watch them if you can. Be informed.